Everyday writing advice for college, career, and life. Real Writing delivers a powerful message to students: Good writing skills are both attainable and essential. 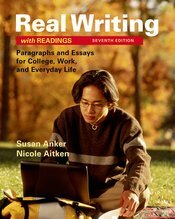 Concise “Four Basics” boxes and engaging paragraph- and essay-writing chapters present the writing process in clear, easy-to-follow steps. Readings that resonate with students’ everyday lives are threaded throughout, with examples ranging from student papers to workplace writing and professional essays. The Four Most Serious Errors and other sentence-level chapters cover grammar in a lively and supportive way, with plenty of opportunities for practice and application. As always, Susan Anker encourages students to connect what they learn with their own goals and with the needs and expectations of the larger world. With this new edition, we asked users to recommend writing samples and candidates for Profiles in Success, a feature that highlights former students in a variety of professions and how they use writing in their jobs, and the resulting book illustrates the diversity of the students and instructors who have been using the book for years. Real Writing with Readings can be packaged at a significant discount with LaunchPad Solo for Readers and Writers, a robust media package that brings together video tutorials, interactive grammar quizzes, and valuable reading and writing instruction that gives students the practice to master the skills they need to succeed. Use ISBN 978-1-319-03616-4 to order Real Writing with Readings and LaunchPad Solo for Readers and Writers.